Scotts Highpark is a freehold condominium situated along Scotts Road, off Orchard Road, with a total of 73 luxurious homes, of which over 30 units are in the ‘penthouse series’. The ‘penthouse series’ comprises single level and duplex apartments, overlooking the lush greenery of Goodwood Hill. Scotts Highpark has two residential towers of 27 and 19 storeys with lush sky gardens built on every four floors. The ‘penthouse series’ at the 27-storey tower at Scotts Highpark comprises of single-level and duplex layouts. These four-bedroom units range from 3,466 sq ft to 4,112 sq ft in size. The duplexes in this series come with private Jacuzzis at the verandas. The second tower, with 19 floors, comprises elegant 2 and 3-bedroom apartments ranging from 1,141 sq ft to 2,110 sq ft. The apartments in Scotts Highpark have large interior living spaces, complemented with a generous stretch of veranda space that runs right across the frontage of the apartments, extending the interior space and creating an expansive living area. 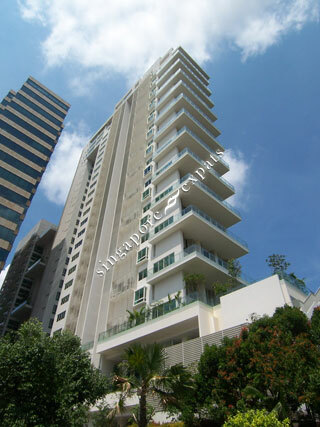 Scotts Highpark is within close proximity to the popular Orchard Road shopping belt and Newton Circus Food Centre. Amenities, food and shopping can be found at Balmoral Court, Balmoral Plaza, Far East Plaza, United Square and Novena Square. Scotts Highpark is also located near to Anglo-Chinese Junior School, Mount Elizabeth Hospital and The American Club. Scotts Highpark is easily accessible via the nearby Pan Island Expressway (PIE) and the Central Expressway (CTE). The Newton MRT Station and other public transport are located right at the door-step of Scotts Highpark.